Sister Salvation is trombonist and arranger Slide Hampton’s breakthrough album as a leader. It’s another one of those typically soulful, warm-sounding, big ensemble productions of the Atlantic catalogue of the early sixties – like the albums of Hank Crawford, David Newman and Milt Jackson. Too good to miss. Nowadays it’s hard to fathom the kind of incredible jazz life Slide Hampton led. Already playing trombone by the age of three, Hampton toured the US with the (XL) family band of his father, providing music at carnivals, circuses and fairs. As a young man, Hampton’s stature grew by playing with Lionel Hampton (no family relation), Dizzy Gillespie and Maynard Ferguson, displaying both his fluent trombone playing and superb arrangements. By 1960, a recording as a leader by the cutting-edge Atlantic label was more than appropriate. 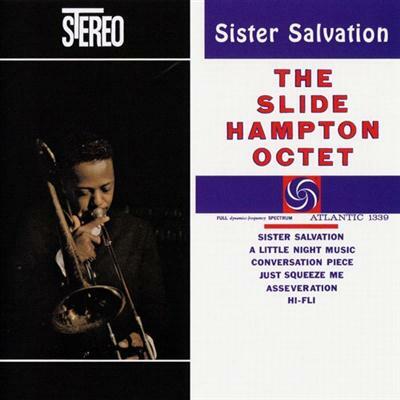 (The release of Slide Hampton And His Horn Of Plenty a year earlier on the obscure Strand label had gone relatively unnoticed) In 1960 Hampton also played on Charles Mingus’ Mingus Revisited and Randy Weston’s Uhuru Afrika. Asservation is a succesful blend of small combo flexibility and big band muscle. One constantly imagines a singing voice prying for attention and I think that kind of vibe is one of the tune’s and album’s greatest qualities. Sister Salvation assuredly has that ‘singing voice’ quality, you’d expect the voice of “Brother” Ray Charles to chime in any minute now. It’s churchy, r&b-type jazz at its best. A Little Night Music, a more lithe, bouncy tune with a pronounced descending bass line, is contagious as well. Hampton also picked interesting tunes of other composers like Randy Weston’s Hi-Fli and Gigi Gryce’s Conversation Piece, that include concise, top-notch solo’s by Freddie Hubbard and George Coleman. In short, the album is a happy marriage between tunes, arranging and soloing. The jazz life of Slide Hampton would continue, bringing many more recordings in the sixties, a job as arranger at pop soul-kingdom Motown and fruitful years as a jazz expatriate in Europe in the seventies and beyond. Hampton has been especially prolific as a recording artist in the new millenium. Twin Records released Hampton’s latest album, Inclusion, in 2014. Tune Up! 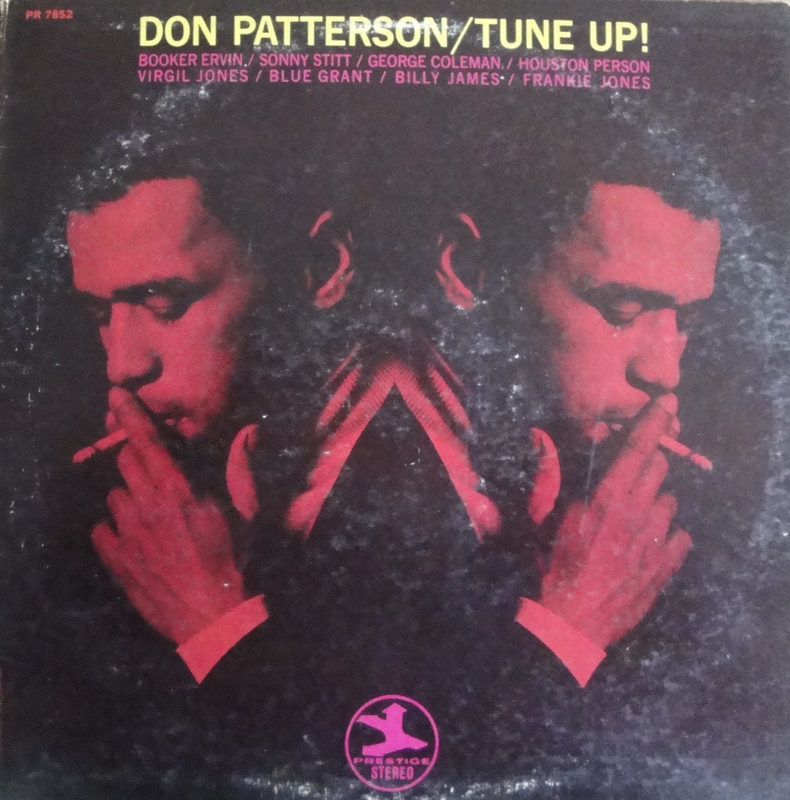 is one more example of a record company’s policy to keep an interest in the career of a musician when he or she is absent with no apparent return ticket attached; in this case Don Patterson, whose hard road of drug abuse at the end of the sixties had become strewn thick with heavy rocks and barbed wire. It didn’t affect his playing on the title track, this album’s most interesting cut, a leftover from a September ’69 session that spawned two high-standard releases – Brothers 4 and Donnybrook. It would be hard to follow up Grant Green’s amazing solo on Miles Davis’ fast-paced composition – Green (credited as Blue Grant) showing no loss of remarkable straight jazz skills during his burgeoning funk jazz period – were it not that Don Patterson rises to the occasion, not tempted to flex his muscles in bragadocious manner, but instead stringing one dynamic, coolly delivered bop run to another, like multiple toy beads. It’s difficult to make head or tail out of an album that presents four tunes from four different sessions, ranging from ‘64 to ’69. This nevertheless belies the good quality of these sessions, what with the standing of Patterson and sidemen such as Stitt, Ervin, Coleman and Jones, who confidently blow their way through standards and blues.